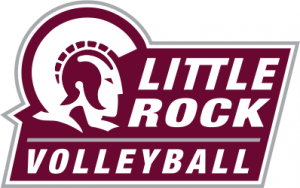 The Trojans Volleyball team fell short 3-1 to the Sun Belt East Division leader South Alabama Friday night on the road. The Trojans looked to hand the Jags their first loss in Sun Belt Conference play. Little Rock was up 20-18 in the first set, before South Alabama went on a 7-1 run to take the frame. However, the Trojans knotted things up in the second set with a six-point victory. The Trojans faltered in the third frame as the Jags went on to win by 11. South Alabama continued their run into the fourth set, taking the match with a 10-point win to secure their victory. The Trojans were led by Junior Veronica Marin who put down a match-high 10 kills, while Junior Taylor Lindberg led the team with 34 assists. Junior Sydnee Martin led the Trojans in digs with 19, while Junior Daisha Gillard had five blocks and sent back five kills. Little Rock will continue its journey through Alabama as it visits Troy on Saturday night at 6:30. The match will air live on ESPN3.